There is no universally available laboratory test to diagnose bile acid diarrhoea (BAD). Objective To conduct a systematic review and meta-analysis to identify a biomarker for idiopathic BAD in patients with functional bowel disorder (FBD) with diarrhoea. Design We searched multiple databases through 15 May 2015. Data were only available to estimate the diagnostic yield of each test (the prevalence of a positive test). Estimates were pooled across studies using the random effects model. Results We included 36 studies, enrolling 5028 patients (24 using 75selenium homotaurocholic acid test (75SeHCAT) retention of <10%, 6 using fasting serum C4, 3 using fasting serum fibroblast growth factor 19 (FGF19) and 2 based on total faecal bile acid (BA) excretion over 48 h). The diagnostic yields (and 95% CI) of abnormal tests were: 0.308 (0.247 to 0.377) for 75SeHCAT retention (<10%), 0.171 (0.134 to 0.217) for serum C4, 0.248 (0.147 to 0.385) for serum FGF19 and 0.255 (0.071 to 0.606) for total faecal BA excretion over 48 h. The majority of the analyses were associated with substantial heterogeneity. Performance characteristics relative to a gold standard test could not be estimated. Conclusions Overall, the test with the highest diagnostic yield conducted in the largest number of studies was 75SeHCAT retention, which is not widely available in many countries outside Europe and Canada. Using different diagnostic tests, 25% (average) of patients with lower FBD with diarrhoea has evidence of idiopathic BAD. These tests serve to identify idiopathic BAD among patients with FBD with diarrhoea. Further studies are required to appraise the performance characteristics of tests for idiopathic BAD. Seven-day scintigraphy 75selenium homotaurocholic acid test (75SeHCAT) retention can identify bile acid diarrhoea; however, this test is unavailable in most countries. New tests are being developed to diagnose bile acid diarrhoea, including serum C4, serum fibroblast growth factor 19 (FGF19) and total faecal bile acid excretion. Identification of bile acid diarrhoea helps select patients for treatment with bile acid sequestrants. Three new tests can identify bile acid diarrhoea. The diagnostic utility of these tests is assessed by systematic review and meta-analyses. An average of 22.5% of patients with functional bowel disorder with diarrhoea has bile acid diarrhoea based on serum C4, serum FGF19 and total faecal bile acid excretion, comparable with the average 30.8% with 75SeHCAT retention alone. Bile acid diarrhoea can be detected by simpler, less costly tests that have the potential to be more widely available. With the introduction of new tests to screen for BAD, specifically fasting serum 7α-hydroxy-4-cholesten-3-one (serum C4), fasting serum fibroblast growth factor (FGF)19 and 48 h total faecal BA excretion by enzymatic or chromatographic/mass spectrophotometric methods,8 several newer studies have been conducted with these methods documenting the occurrence of abnormal BA synthesis (C4), control (FGF19) or excretion (total faecal 48 h excretion) in BAD. The prevalence of BAD in patients with IBS-D or functional diarrhoea, based on these different methods, is unclear. The pertinent literature does not always specify whether the cohort studies were conducted in patients with IBS-D or with chronic unexplained or functional diarrhoea. Given the large degree of overlap and conversion between these two symptom complexes, as documented in the literature,9–11 we have analysed the literature for these two conditions together and applied the term functional bowel disorder (FBD) with diarrhoea; however, we excluded studies of patients with microscopic colitis and postcholecystectomy diarrhoea. Since there is no current, generally available, gold standard method for diagnosis of BAD, it is not possible to estimate sensitivity and specificity or to test predictive values of the different tests. Therefore, our aim was to evaluate the diagnostic yield, defined as the prevalence of a positive test relative to established normal values in healthy controls, in order to appraise the potential of these tests to serve as biomarkers for BAD in patients with lower FBD with diarrhoea. We included all observational studies pertaining to subjects aged ≥18 years. Subjects were diagnosed with IBS-D or functional diarrhoea or had no organic explanation for their chronic diarrhoea. The diagnosis was based on one of the validated symptom-based criteria such as Manning criteria,13 Rome criteria14 or the presence of a description consistent with these disorders (ie, >3 bowel movements per week for at least 3 months with or without pain) in those who had received extensive evaluation to exclude organic causes of chronic diarrhoea. We excluded studies that did not provide sufficient evidence that the patients with a positive test for BAD were specifically documented to suffer from IBS-D and functional diarrhoea. Subjects were tested for abnormal BA parameters by means of 75SeHCAT, serum C4 (studies reporting corrected C4 for serum cholesterol were excluded), serum FGF19 or total faecal BAs in 48 h. The outcome of interest was the diagnostic yield of each test, that is, the proportion of patients with positive results with each test. The studies had to be published in peer-reviewed journals, and the search was not restricted by language. We excluded studies that included subjects <18 years of age or those conducted in patients with history of cholecystectomy, microscopic colitis or other aetiologies of diarrhoea or causes of BAM such as Crohn's disease, radiation enteritis or ileal resection. In January 2015, a medical librarian at Mayo Clinic with expertise in conducting searches for systematic reviews conducted a literature search of the following: PubMed, Embase (1988–2015), Ovid MEDLINE In-Process & Other Non-Indexed Citations and Ovid MEDLINE (1946 to Present), Evidence Based Medicine (EBM) Reviews—Cochrane Database of Systematic Reviews (2005 to November 2014), American College of Physicians (ACP) Journal Club (1991 to December 2014), Database of Abstracts of Reviews of Effects (4th Quarter 2014), Cochrane Central Register of Controlled Trials (November 2014), Cochrane Methodology Register (3rd Quarter 2012), Health Technology Assessment (4th Quarter 2014, NHS Economic Evaluation Database (4th Quarter 2014). Initially, terms and/or abbreviations used to describe IBS and functional diarrhoea were combined into a search strategy in PubMed. Next, free-text terms were used to conduct further searches and then used in various combinations to include sensitivity and ensure that an exhaustive search through the available databases was conducted. The searches were date-restricted only by the scope of the range of dates that spanned each of the databases, and were not restricted by language. In May 2015, the search strategy was expanded to ensure a comprehensive and exhaustive search of the literature. The expanded search also explored combined searches that included the terms ‘and’ as well as ‘or’, expansion of terms related to C4 to exclude confusion with the fourth component of complement and use of the term ‘malabsorption’ in addition to diarrhoea. A detailed description of the search strategy is included in the online supplementary material. Finally, an expert in this field of study (MC) was consulted for additional potential references. The titles and abstracts of the references identified through the above search strategy were screened. 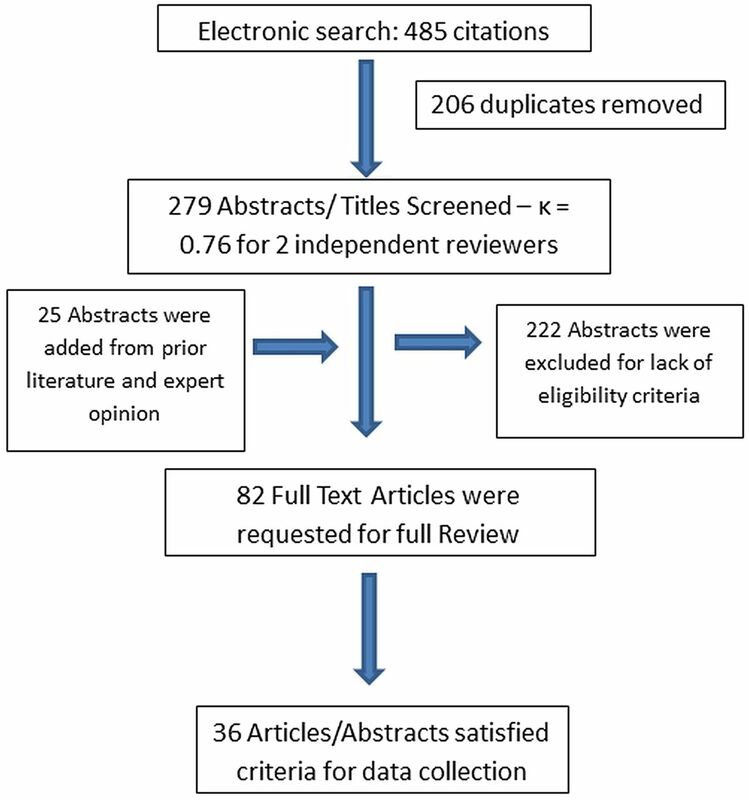 Subsequently, the full text articles or abstracts of the references thought to be relevant were also reviewed, though the only report that corrected serum C4 levels for serum cholesterol was not included in the pooled analysis of C4.15 The selection process for inclusion of the candidate references was performed by two independent and blinded reviewers (NV and OA). Any disagreement on the eligibility of a paper was resolved by a third author who was an expert in the field of FBDs and BAs (MC). A kappa statistic was calculated to evaluate inter-observer agreement and to increase validity and reliability of the study. Quality was appraised independently by two of the authors (PV and OA). The reviewers worked independently using a comprehensive form and extracted the following information from each study: demographic data of patients, study objectives, inclusion and exclusion criteria and detailed information about the intervention and outcomes of interest. Data were extracted by two blinded independent reviewers, and the outcomes were reviewed by a third reviewer. The principal study outcome measures were the number of patients who presented with either functional diarrhoea or IBS-D and the number of patients from this population that tested positive for idiopathic BAD using any of the diagnostic tools mentioned above. These primary outcome measures were used to calculate the diagnostic yield (and 95% CI) of all the different tests used to diagnose BAD across studies. The diagnostic yield was defined as the proportion of patients presenting with IBS-D or functional diarrhoea that, after exclusion of all other possible causes of BAD, were identified as having true idiopathic BAD as a result of measurement using the diagnostic tool. The diagnostic yield may be used as a surrogate for the prevalence of a positive test. In cases where there were no individual data reported, the authors were contacted directly, and were requested to provide individual data for outcome measurement. Direct contact was required for individual data in studies conducted at Mayo Clinic that included FGF19 and total faecal BA data; these individual-level data had not been included in the publications. In the articles that used 75SeHCAT as a diagnostic tool, we were also interested in the prevalence of BAM based on different cut-off values. The critical appraisal tool developed by Munn et al was used to evaluate the quality of each study.16 We selected this tool because our outcome of interest was the prevalence of positive tests, that is, diagnostic yield, and this tool was developed for use in systematic reviews addressing questions of prevalence. Initially, a calibration exercise was performed by the review team members to ensure consistency and validity in assessing the risk of bias with this critical appraisal tool. Two reviewers (PV, OA) independently reviewed each included study, and evaluated methodological features, including study design, the collection of a representative sample, recruitment of participants, sample size, setting, subject description, outcome measurement, data analysis and adjustment for confounders. The level of risk of bias was assessed by combining the percentage of ‘yes’ responses to each of the 10 questions (see online supplementary material—table) across each individual study. A study with 7–10 out of 10 questions answered ‘yes’ was considered to have low risk of bias; a study with 4–6 out of 10 questions answered ‘yes’ was considered to have moderate risk of bias and a study with 1–3 out of 10 questions answered ‘yes’ was considered to have high risk of bias. A third reviewer evaluated both assessments independently, and conflicts were resolved by consensus. All analyses were performed using a random effect model due to expected heterogeneity across studies’ settings. Since no gold standard test was used in the included studies, we were only able to estimate the prevalence of a positive test (ie, the diagnostic yield). This rate was pooled across studies to generate a pooled estimate with 95% CI. Heterogeneity was assessed using the I2 statistic. This statistic represents the proportion of variability that is not attributable to chance. I2 values over 50% indicate substantial heterogeneity. After building broad searches for relevant topics and combining them, a total of 24 abstracts were retrieved from PubMed, 191 relevant abstracts were retrieved from Ovid MEDLINE In-Process & Other Non-Indexed Citations and Ovid MEDLINE (figure 1). In addition, 16 relevant abstracts were found from all EBM reviews, and 254 were identified from Embase. After removing all duplicates across the various databases, the total number of identified abstracts was 279. Of these 279 abstracted articles, 57 were thought to be relevant based on our eligibility search criteria. The calculated kappa value for observer agreement between two reviewers was 0.76. Additional studies that met eligibility search criteria were identified from a variety of sources identified by review of references available in a previous systematic review on the prevalence of BAM using 75SeHCAT retention measurement,7 identified by a content expert in the field of study (MC) and articles published in abstract form. A total of 36 studies satisfied all eligibility criteria. Information regarding the characteristics of each study is summarised in table 1. The results of the critical appraisal of each study using the Joanna Briggs Institute Prevalence Critical Appraisal Tool16 are summarised in table 2. The majority of the studies had a prospective design (67%). Approximately 30% of the studies reported identifying subpopulations based on severity of idiopathic BAD by evaluation of 7-day 75SeHCAT retention. Overall, the risk of bias (to estimate a prevalence) for all studies was low to moderate. 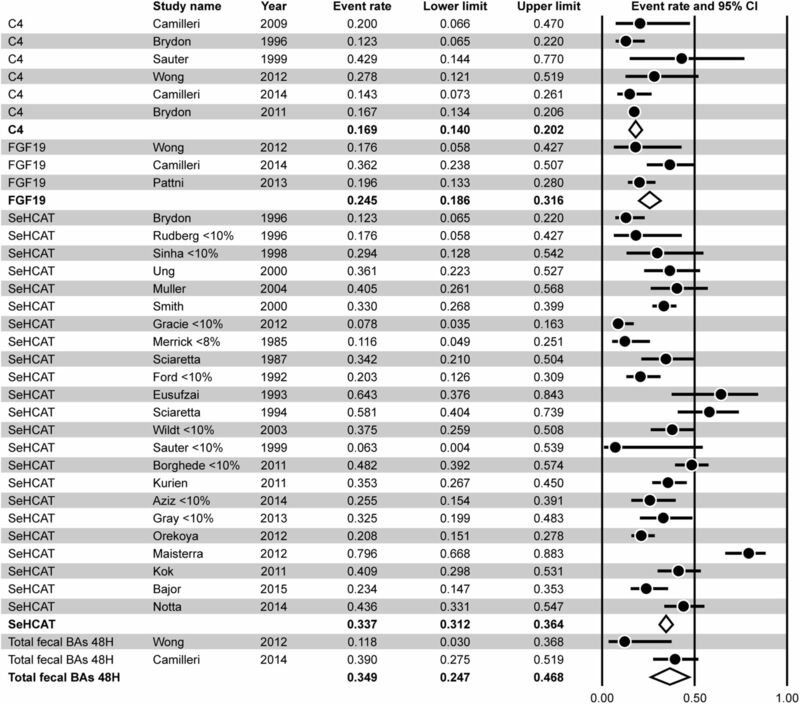 Meta-analysis results are depicted in figure 2. Studies were divided into groups according to the diagnostic tool used to measure BAM. A total of 24 studies measured 75SeHCAT retention of less than 10%, 6 studies measured serum C4, 3 measured serum FGF19 and 2 studies measured total faecal BA in 48 h. It should be noted that only three studies included more than one of the measurements of interest for this pooled analysis. For each test, the diagnostic yield was defined as the per cent of subjects with a confirmed diagnosis of IBS-D or functional diarrhoea who tested positive for idiopathic BAD. This diagnostic yield can be interpreted as the probability of having a positive result. Meta-analysis of diagnostic yield for serum C4, serum fibroblast growth factor 19 (FGF19), 75selenium homotaurocholic acid test (75SeHCAT), total faecal bile acids (BA) in 48 h. Note that studies where multiple diagnostic parameters are tested are analysed individually for each test. The highest diagnostic yield was observed with 75SeHCAT (0.308, 95% CI 0.247 to 0.377, I2=87%) followed by total faecal BA in 48 h (0.255, 95% CI 0.071 to 0.606, I2=74%). The diagnostic yield for fasting serum FGF19 was 0.248, 95% CI 0.147 to 0.385, I2=62%. Serum C4 had the lowest diagnostic yield of all the tests (0.171, 95% CI 0.134 to 0.217, I2=14%). Thus, heterogeneity was high for all diagnostic tests except C4, indicating a high degree of variability across the majority of studies that cannot be explained by chance. Given that 75SeHCAT retention measurements are characterised in the literature at three levels of severity (0%–5% severe, 5%–10% moderate, 10%–15% mild), we assessed those studies that reported individual data on the number of patients with a positive test for idiopathic BAD stratified by severity, and we conducted a subanalysis of the diagnostic yield for different cut-off values. Only a subset of studies reported the data specifically for these three cut-offs. The results are summarised in table 3. The diagnostic test with the highest prevalence of positive results was 75SeHCAT retention, measured by external scintigraphy usually at 3 h and 7 days after oral administration of the gamma-emitting synthetic BA. It had been claimed that in patients with ileal dysfunction or diarrhoea, 75SeHCAT retention had a sensitivity of 100% and specificity of 94%;56 however, patients who had ileal resection constituted the vast majority of patients in that study, and there was no gold standard comparator to definitively document the performance characteristics of the 75SeHCAT retention test. For these reasons, the precise diagnostic accuracy in patients without ileal resection is unclear. 75SeHCAT is not available in the USA and many other countries; hence, the development of alternative diagnostic tests to identify idiopathic BAD in clinical practice is important. Two serological tests evaluated were serum C4 and FGF19,58 which had positive results in 17.1% and 24.8%, respectively, in the current analysis. Although larger numbers of patients are needed to appraise the prevalence based on the diagnostic test, these serological methods are convenient and attractive as screening tests for BAD. In addition, comparative studies for serum C4 have been reported with 75SeHCAT retention42 and with faecal BA excretion over 48 h from our laboratory.50 The latter study showed significant correlation between the two tests (rs=0.606, p<0.001). The 48 h faecal BA excretion was elevated in an average of 25.5% of patients, making it the test with the second highest diagnostic yield of the four tests evaluated. However, this average rate of positive results was based on only two studies; thus, further studies are warranted to establish the diagnostic yield of this test. While this test is more laborious than the serological tests, it is clearly the most direct measurement of BA malabsorption, and it can be performed on the same sample collection as that for faecal fat. One potential pitfall is that combining the two measurements of faecal fat and BA requires the ingestion of a 100 g fat diet over 4 days, and it is unknown what impact this has on the faecal BA excretion. This systematic review has several strengths and limitations. To our knowledge, it is the first systematic review with quantitative meta-analysis that evaluated all the currently available biomarkers related to BAs in FBD with diarrhoea. We conducted a comprehensive search of multiple databases, reviewed studies by independent reviewers and our team included content as well as methodology experts. The main limitation of this analysis is the lack of a gold standard test; therefore, we were unable to provide diagnostic accuracy measures (ie, sensitivity and specificity). Nevertheless, we believe that providing the expected prevalence of a positive test can help patients and physicians engaged in decision-making about how to proceed with a diagnostic work-up. Approximately 25% of patients with FBD with diarrhoea (IBS-D or functional diarrhoea) has evidence of BAM or excessive BA synthesis. These data suggest that tests for BAD should be performed in patients presenting with these symptom complexes prior to exposing patients to an empiric trial of BA sequestrants. Exclusion of BAD may also be indicated prior to more expensive and invasive testing, such as repeat endoscopy with biopsies or CT searching for rarer diseases that may present with chronic diarrhoea. Similarly, given the prevalence of >25% of patients with FBD and diarrhoea having evidence of BAD, it appears that testing for BAD should be considered prior to clinical trial entry for testing novel therapies in IBS-D.
We thank Cindy Stanislav for secretarial assistance, and Patricia Erwin and Matthew Hoy, librarians.
. Bile Acid-Induced Diarrhea. Clin Gastroenterol 1986;15:567–82.
. Bile acid malabsorption in patients with post-vagotomy diarrhoea. Ann Chir Gynaecol 1992;81:351–3.
. Bile acid malabsorption investigated by selenium-75-homocholic acid taurine ((75)SeHCAT) scans: causes and treatment responses to cholestyramine in 298 patients with chronic watery diarrhoea. Eur J Intern Med 2011;22:e137–40.
. An evaluation of the use of serum 7-alpha-hydroxycholestenone as a diagnostic test of bile acid malabsorption causing watery diarrhea. Can J Gastroenterol 2011;25:319–23.
. Validating biomarkers of treatable mechanisms in irritable bowel syndrome. Neurogastroenterology & Motility 2014;26:1677–85.
. Bile acid malabsorption in patients with chronic diarrhoea. Scandinavian Journal of Gastroenterology 1993;28:865–8.
. Bile acid malabsorption in microscopic colitis and in previously unexplained functional chronic diarrhea. Dig Dis Sci 2001;46:2231–8.
. Use of the SeHCAT test in the investigation of diarrhoea. Postgrad Med J 1992;68:272–6.
. The prevalence of bile acid malabsorption in irritable bowel syndrome and the effect of cholestyramine: An uncontrolled open multicentre study. European Journal of Gastroenterology and Hepatology 1992;4:533–7.
. Bile acid malabsorption: a review of sehcat testing in belfast. Gut 2013;62:A20.
. Abdominal pain distinguishes idiopathic bile acid malabsorption (BAM) from diarrhoea-predominant irritable bowel syndrome (IBS-D). Gut 2013;62:A123.
. An Audit of Clinical Outcomes of Sehcat Study in Patients with Chronic Diarrhoea. Gut 2013;62:A284-A.
. Abdominal retention index of 75SeHCAT according to response to treatment with resincolestiramina. Eur J Nucl Med Mol Imaging 2014;41:S356.
. Response to bile acid sequestrants is poor in patients with equivocal SeHCAT results. Gut 2012;61:A347.
. Prognosis of adult-onset idiopathic bile acid malabsorption. Scandinavian Journal of Gastroenterology 1999;34:587–90.
. Bile acid malabsorption as a cause of chronic diarrhea: diagnostic value of 7alpha-hydroxy-4-cholesten-3-one in serum. Dig Dis Sci 1999;44:14–9.
. 75SeHCAT test in the detection of bile acid malabsorption in functional diarrhoea and its correlation with small bowel transit. Gut 1987;28:970–5.
. Absence of histopathological changes of ileum and colon in functional chronic diarrhea associated with bile acid malabsorption, assessed by SeHCAT test: a prospective study. Am J Gastroenterol 1994;89:1058–61.
. Prevalence of bile acid malabsorption as a cause of diarrhoea in consecutive new patient referrals to a gastroenterology clinic. Gastroenterology 2014;1:S-706.
. Bile acid malabsorption in persistent diarrhoea. J R Coll Physicians Lond 2000;34:448–51.
. [SeHCAT scanning in bile acid malabsorption]. Ugeskr Laeger 1998;160:5362–5.
. Impact of bile acid malabsorption in steatorrhoea and symptoms in patients with chronic diarrhoea. Eur J Gastroenterol Hepatol 2000;12:541–7.
. Bile acid malabsorption in patients with chronic diarrhoea: clinical value of SeHCAT test. Scandinavian Journal of Gastroenterology 2003;38:826–30.
. Use of 23-Selena-25-Homocholyltaurine to Detect Bile-Acid Malabsorption in Patients with Ileal Dysfunction or Diarrhea. Gastroenterology 1986;91:1–9.
. Altered bile acid metabolism in patients with constipation-predominant irritable bowel syndrome and functional constipation. Scandinavian Journal of Gastroenterology 2008;43:1483–8. Contributors NV: review of articles for eligibility and data extraction, authorship. MC: principal investigator, content expertise, authorship. OA: review of articles for eligibility, evaluation of quality. PV: data extraction, evaluation of quality. AA: coinvestigator, content expertise. ADN: data extraction. MHM: supervision of review methodology and statistical analysis. Guarantor of the article: MC accepts full responsibility for the conduct of the study. Funding MC is supported by grants R01-DK92179 and R01-DK67071 from National Institutes of Health. The work was also supported by CTSA grant UL1 TR000135 from the National Center for Advancing Translational Sciences (NCATS), a component of the National Institutes of Health (NIH).